It’s rare to see otome games (ie: visual novel games with dating sim elements geared towards women) like Hakuoki: Stories of the Shinsengumi make their way to North American audiences, and yet this isn’t the first iteration of Hakuoki to make the journey. 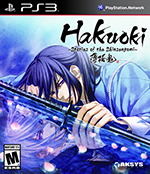 This most recent PlayStation 3 release brings together the original PlayStation 2 game Hakuoki: Demon of the Fleeting Blossom with a fan disc called Hakuoki Zuisoroku that features plenty of extras new to North American audiences. 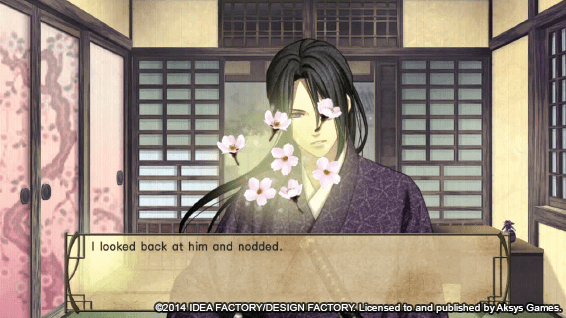 This was my first foray into the world of Hakuoki, so I went in with a pretty open mind. Was it more or less than I was expecting? Read on to find out. Hakuoki: Stories of the Shinsengumi takes place during Japan’s Edo period, a time of political and social turmoil. 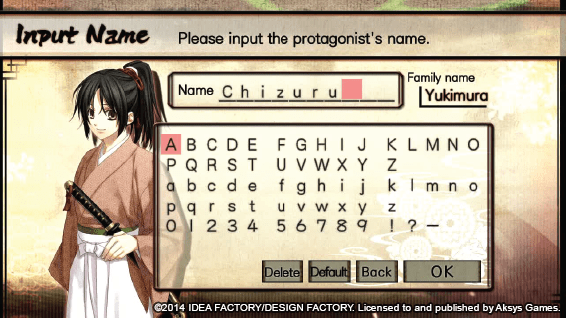 Central to the story is Chizuru Yukimura, a young girl who travels alone to Kyoto in search of her missing father. However, after a dangerous encounter one night, she’s taken under the wing of the Shinsengumi, an organization central to the struggle between the shogunate and imperial rule. The game’s story really has three major facets that intertwine: Chizuru’s search for her father, a supernatural element I won’t mention because spoilers and the political upheaval happening in Kyoto. However, Chizuru’s story quickly fades into the background and gets lost amongst the rest of the goings-on. Sure, her father is still mentioned occasionally; but Chizuru does little to actually find him, and long periods of time go by without her even mentioning him at all. It’s really not uncommon for main characters in romantic games like this to be a little bland. In theory, that allows for the player to better imagine themselves in the protagonist’s place. But I really do wish Chizuru had more drive to achieve her goals and more unique traits that weren’t dictated by the story. Her search for her father becomes less of a plot point and more of a throwaway excuse for her to be with the Shinsengumi, which was disappointing. The Shinsengumi themselves are a fun and interesting bunch. Each character has a distinct personality and a gorgeous character design to match. It’s also important to note that the majority of the game’s characters were not created for the sake of the game. 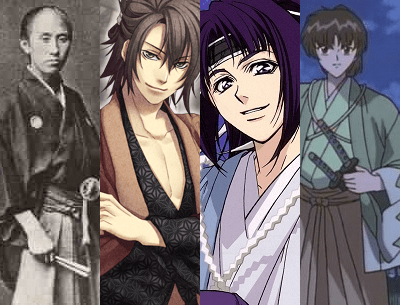 Each of the members of Hakuoki‘s Shinsengumi were real people, and the storyline more or less follows the true events of their lives. Some liberties of various sizes have been taken with the details, of course. Below are a few images of Souji Okita, captain of the first unit of the Shinsengumi. The second image is him from Hakuoki, while the other two are from Peacemaker Kurogane and Rurouni Kenshin, respectively, for comparison. I really wonder how Souji would feel about his animated counterparts. 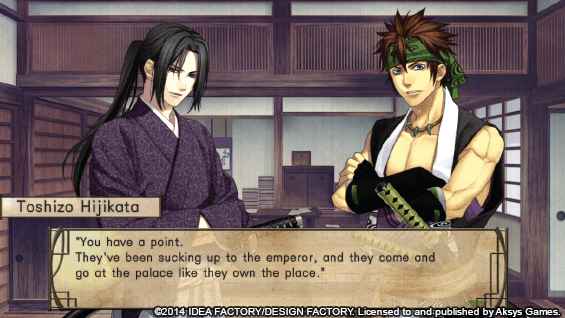 So, yeah, I can’t say that Hakuoki as a whole is entirely historically accurate. However, the game does focus a lot more on Japan’s history than I had originally assumed. There is the supernatural element to the story that is pretty substantial, as well, but the bulk of the narrative has to do with various battles that actually happened, discussions of the different political and sociological ideals from the time period, and the lives of many historical Japanese individuals. While this might sound dull out of context, it’s actually all extremely interesting and directly tied to the fates of pretty much everyone in the game. I wasn’t expecting an otome game to teach me so much about history, but there you have it. There’s also an encyclopedia that players can access as they play through the story. New terms and characters will come with a brief description to let the player know what their role is both historically and in-game, which is very useful for those who don’t already have an active understanding of Japanese history. 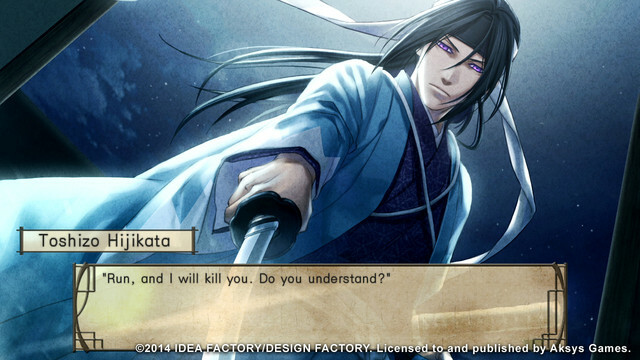 Surprisingly, the dating sim elements in Hakuoki are rather subtle. The men of the Shinsengumi are really not overly concerned with courting the lady in their midst, and that’s understandable, seeing as there’s a war brewing. I both appreciated this and felt that it was a little disappointing. Most of the guys are very dismissive of Chizuru, sometimes to the point of being cold and downright insulting. I felt bad for the poor girl a lot of the time. Of course, this changes as you get to know the men better and start to go down more romantic paths in the storyline. It’s refreshing, too, that, at least at the beginning, the male characters don’t act like their lives revolve around Chizuru in an overly doting way. It’s plot elements that drive the characters together more so than the characters themselves, and it’s up to the player to make in-game choices that will have Chizuru present at critical moments or act at the right time. This also makes the eventual romantic plots and scenes that much more rewarding when they finally do appear. Depending on your choices, you can get multiple endings. There are the obvious ones where you end up with the Shinsengumi man of your dreams, but less savvy players might find themselves with a “bad end,” or one where they end up with no one. I got the latter of those my first playthrough. The fact that a happily-ever-after romantic ending isn’t guaranteed is part of the appeal of this game, though. It’s making me be a lot more cautious with my choices my second time through. Speaking of replay value, this game has a ton of it. The multiple endings and romantic paths are a major bonus, of course. There’s also a gallery where still-shots of special moments from the game can be unlocked as you become closer to each character or trigger certain story elements. 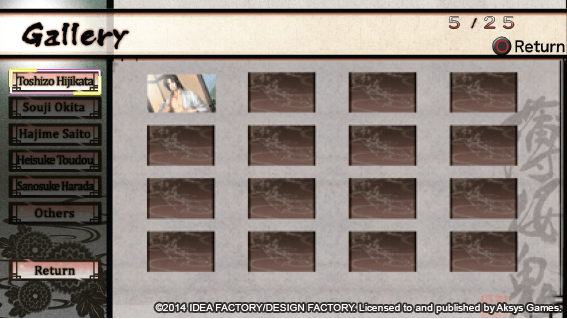 On top of the gallery, there’s a Hakuoki Stories portion where you can unlock additional gameplay by replaying the main storyline and progressing down different routes. The game makes it easy to retrace your steps too with a fast-forward option. Players can set it to fast-forward all text or just the bits you’ve already read. When it comes to making an in-game choice, the ones you’ve already chosen will be highlighted to remind you where you’ve already been. And, if you’re really not interested in going through the entire game all over again just to get to a choice late in the story, there’s a timeline called the “Record of Service” that lets you choose what chapter and what section of that chapter you start in. Frankly, replaying this game is no chore. When trying to get yourself on the right romantic path, it can be hard to gauge where you are with any given character, given the lack of outright romance early on. Thankfully, there are some mechanics available to let you know where you stand with the men of the Shinsengumi. When you make a choice in-game that a character approves of, a cherry blossom graphic will appear briefly on the screen. The game actually records how many of these “cherry blossom moments” you encounter. The higher your percentage, the more special graphics and mini-events you’ll be able to access. You can also find a gauge in the encyclopedia for each character letting you know how romantically-inclined they are towards Chizuru at that point in your current playthrough. Moving away from the story and the romance a little bit, the game’s graphics deserve a special mention. As I touched on earlier, the character designs by Kazuki Yone are really beautiful. One interesting thing they’ve done with the character graphics in this iteration of Hakuoki is a very subtle animation. Characters will shift slightly, appear to breath and their mouths will move as they speak. I thought the effect had a strange, rubbery look to it at certain moments, but it does lend the characters a little bit more life than a static 2D image would. The background images are all pretty and appropriately detailed for the setting without being overly distracting. The music is very similar to the background images in that way- it’s all appropriate and pretty, but there’s nothing particularly catchy other than the game’s opening theme song. I found the music very easy to tune out, though I was never annoyed by it enough to want to mute my TV. Of course, the music was meant to be background noise to the main event: the voiceovers. Even though there’s only a Japanese track available and I could often read the text faster than it took to listen, I did end up listening to the voiceovers all the way through more often than not. The actors all do a fantastic job, and the voices are appropriate to each character. While having an English dub would have been interesting, I was also happy with just the Japanese option. 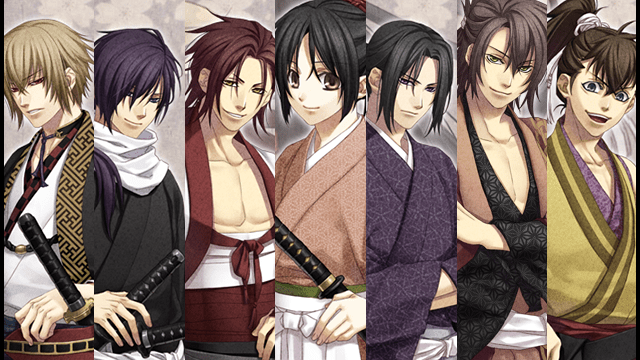 Overall, I was extremely impressed with what Hakuoki: Stories of the Shinsengumi had to offer. The story was multifaceted, and brought a lot more to the table than just a straightforward romance. Although it might not take you long to finish your first playthrough — it took me about six hours total — the replay value of the game is enormous. I expect to clock in at least four times that amount of hours exploring every diverging path and unlockable storyline. While I would have liked a more interesting heroine and a slightly more cohesive story, I would readily recommend this game to anyone interested in the visual novel genre. Considering the sheer amount of content and extras, I think the $39.99 US price tag for the physical and digital copies is worth it. If you have some extra cash, you can also order a special edition with collectable box and other bonus items for $59.99 US. Game was provided by the publisher.